Portland is one of the coolest bike cities in the world, and the Filmed by Bike film festival is certainly one of the reasons why. 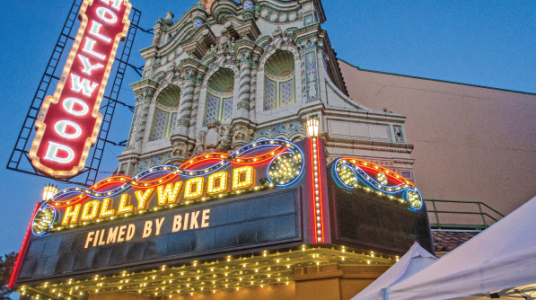 The festival features the world’s best bike movies with six distinct themed programs playing over the course of three days. Just what makes these films the best in the world? The festival spends eight months hunting for movies and a panel of jurors reviews them all to select the very best. This year’s jury included notables such as Chris King of Chris King Precision Components and Barry Braverman, a Director of Photography involved with many Wes Anderson projects. Filmed by Bike is an inventive arts and culture event, with bike-themed activities all long. Our favorite is the Street Party on opening night. New this year, the part will take place in the street in front of the Hollywood Theatre. Festival Pass: See it All! With a wealth of movies and activities all weekend long, the Festival Pass is by far the best way to experience Filmed by Bike. You’ll save money, get access to exclusive activities and be able to reserve your tickets in advance.